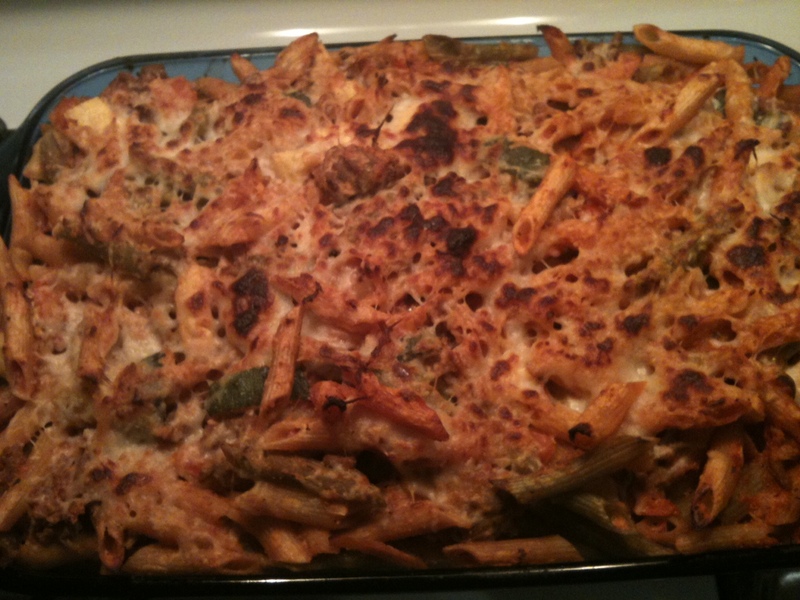 My dad’s famous dish, “I Needi Ziti” has been revamped. 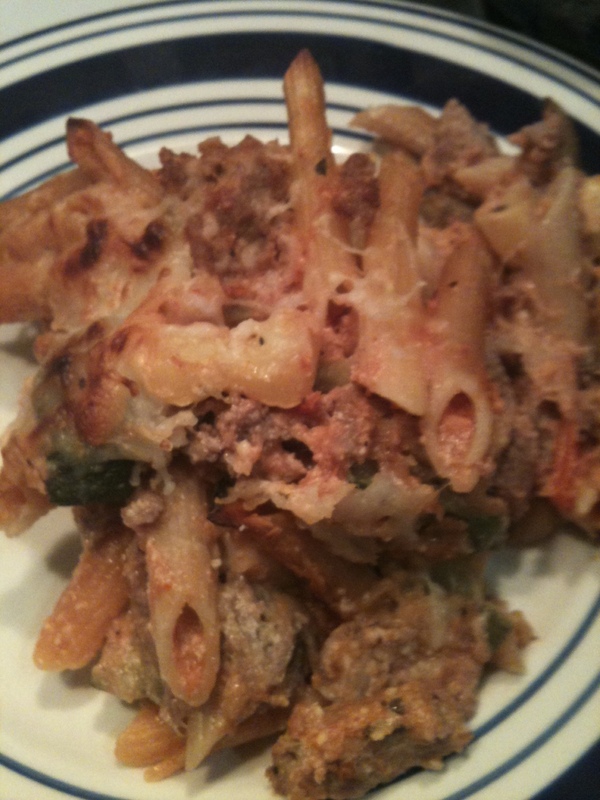 When I was younger and my parents first split up, my brother and I would go over to his place and he’d make us “I Needi Ziti” and “Thick Shakes” (we lovingly called them) – basically, super delicious baked ziti that tasted the best only when my dad made it, and chocolate ice cream and milk in a glass that you stirred until it was just barely drinkable. Just thinking about it brings tears to my eyes because it was such a difficult time for us, but they were such comforting foods that it made it seem like everything was going to be okay. This time, circumstances are different, which made me change-up the recipe – a new tradition based on old memories. Cook pasta according to directions, until al dente (I prefer more of a “bite”). Clean and coarsely chop all vegetables. Add to medium-hot pan with extra virgin olive oil, salt and pepper, and saute until slightly brown. In separate pan, add some extra virgin olive oil to hot pan. Once fully heated, add thawed ground turkey, salt and pepper. Cook until just browned. 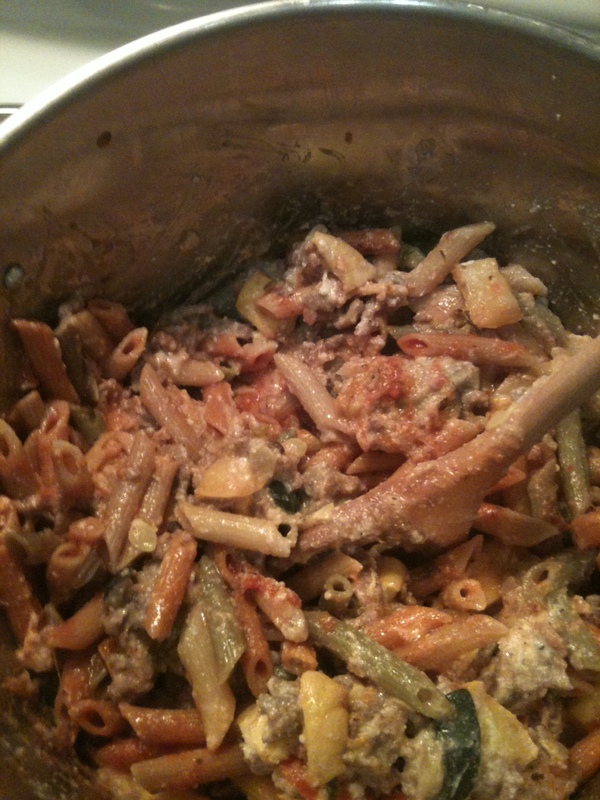 Once all ingredients are cooked, add pasta, ground turkey, and cooked veggies to large pasta pot. Then, add the red sauce and ricotta cheese. No need to turn on the heat for this pot because everything will still be hot, and you don’t want to cook these anymore. Gently mix together until everything is covered in sauce evenly. Transfer everything from pasta pot to large 13×9 glass baking dish. I like to add a little bit of pasta, then add some shredded cheese, then more pasta. Layers of cheese really makes it! 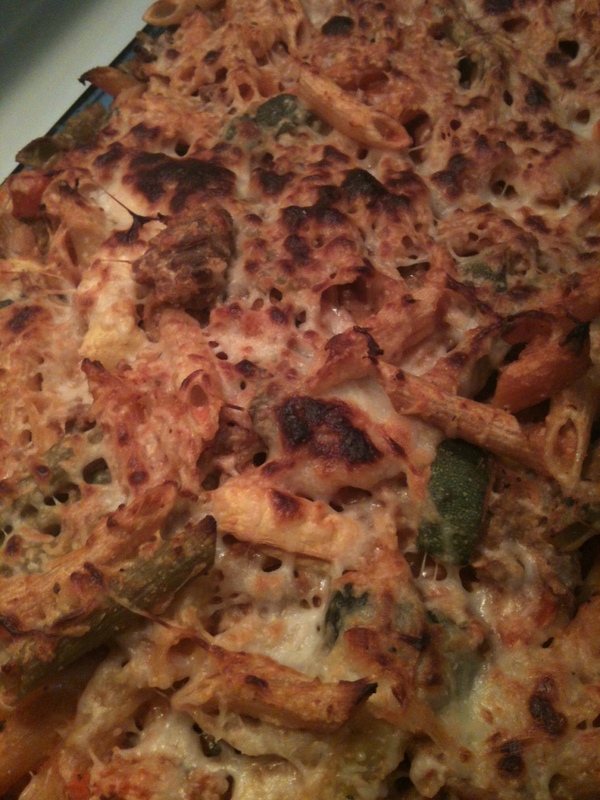 Once all pasta is in the pan, add an extra-thick layer of shredded cheese to the top. Cover with aluminum foil and bake for 45 minutes. For the last 10-15 minutes, uncover and let cheese bake. If not brown to your liking, broil for an additional 5 minutes. Let cool for 10-15 minutes. When plating, grate some parmesan cheese on top and enjoy! *garden pasta has 1 serving of vegetables per cup, and it’s multi-colored. healthy and fun!